With 24/7 Monitoring and Professional Support. We don’t cram hundreds of servers into ad-hoc, multi-tenant environments like other hosts. With RedisGreen, your servers are 100% isolated and 100% dedicated. 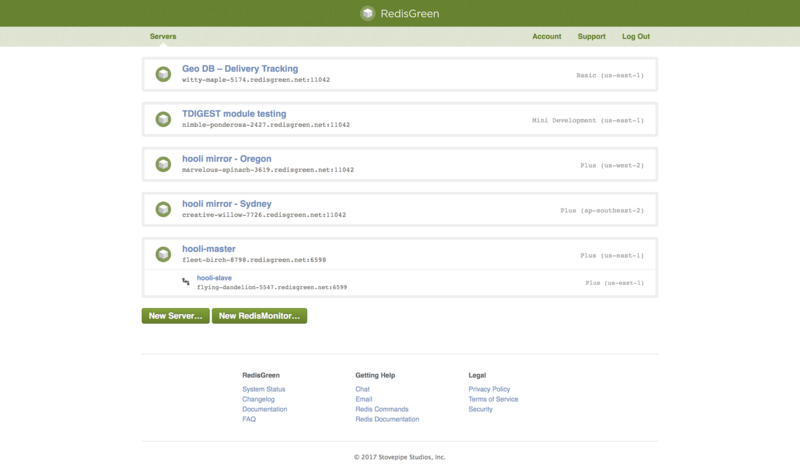 We monitor RedisGreen servers at the database, host, and network levels and have engineers on-call 24/7. If a problem occurs, we'll respond within minutes, not hours. You choose how many Availability Zones you want to use and RedisGreen will balance replica setups across them. All support requests go directly to engineers with years of experience with Redis. We don’t filter emails through interns or salespeople. Just ask — we'll work with you to balance the durability, availability, and performance tradeoffs specific to your application. We don't promise "infinite scalability", "multi-core Redis", magic scaling pixie-dust, or other false promises. What we promise is the best service and support, period. 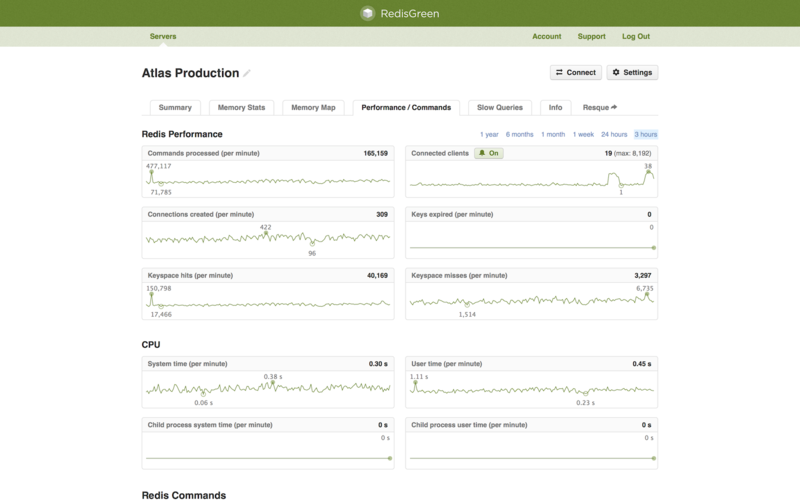 Get the most out of Redis with our continuously collected health metrics and performance statistics for every command run on your server. We support all AWS regions — from North Virgina to São Paulo, we've got you covered. Don't use AWS? Send us an email. 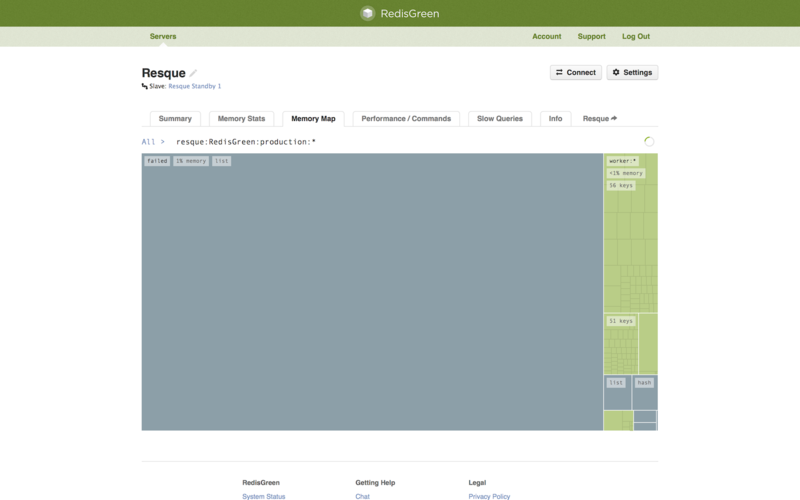 RedisGreen builds a visual map of your database, letting you see how your data is allocated. RedisGreen can automatically upgrade the capacity of your Redis database, ensuring that you don't run out of memory at critical times. 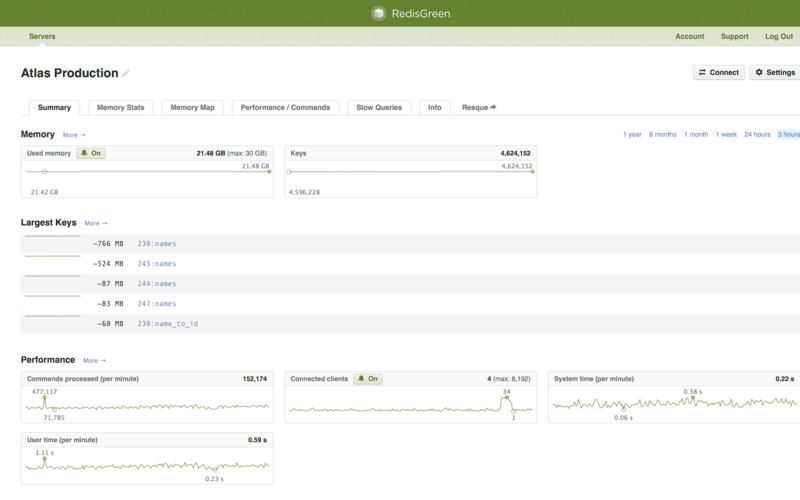 RedisGreen can proactively alert you when metrics on your database reach particular thresholds. We hold RedisGreen to a higher standard. That's why we're the only managed Redis service that publicly documents all service interruptions and posts uptime percentages for our entire fleet of servers.